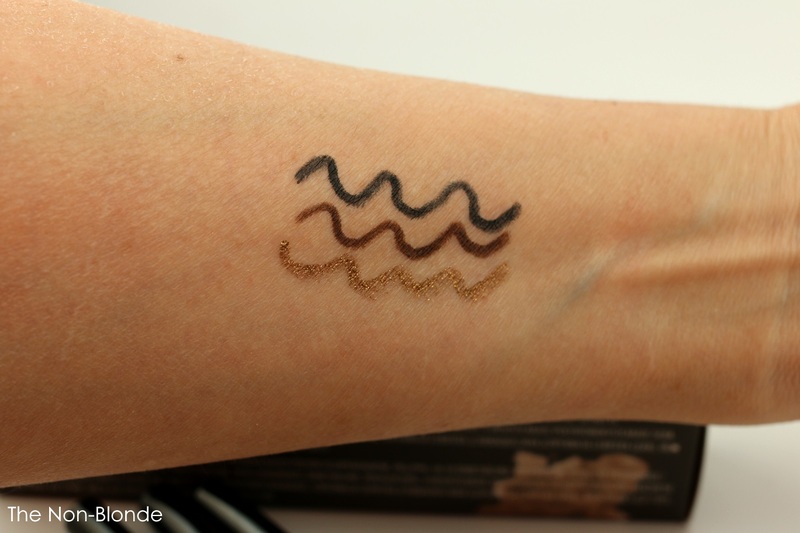 I bought this eyeliner trio by Ardency Inn because I wanted the one called Gold. Really wanted it. Since the price of a single pencil is $19 and the set offers three full size pencils it was an easy choice. At the rate I use black and brown eye liners there's always room for more in my collection. Still, it was all about Gold, which isn't gold at all but more of a bronzy shade, or a dirty gold. Whatever you call it, the color is gorgeous and unique enough, and it's also quite versatile, as it works alone or on top of a black base. Ardency Inn say that their Modster eyeliners are waterproof. They would do themselves a huge favor if they abandon this claim. Using the pencils on the waterline results for me in a huge mess within a few hours. Some people may appreciate the lived-in smudgy look. I don't, especially when it's utterly non-intentional. However, when drawn along the top lashes the line stays put nicely and doesn't migrate (my lids aren't oily and I always use a primer). My favorite way to work with these Ardency Inn pencils is to go over the black with the gold(ish) one, but you can also use it to enhance an eye shadow. 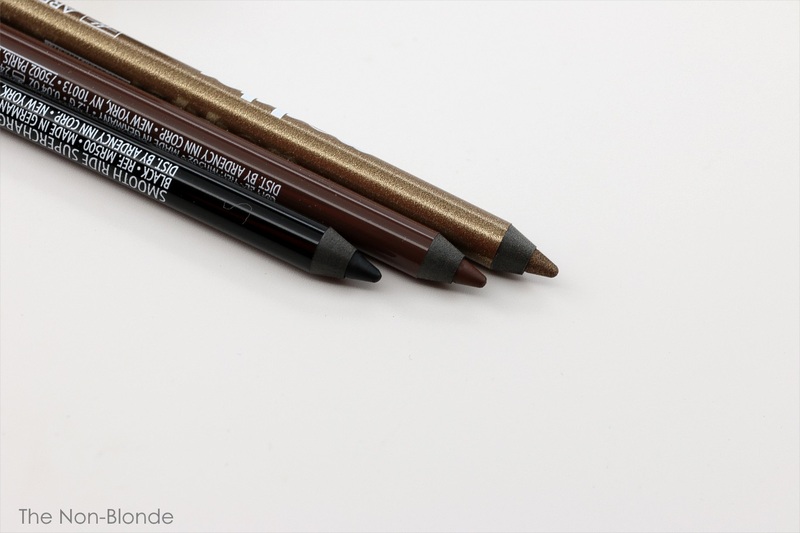 The texture of the pencils is gel-like and wonderful to apply. They glide on without skipping or tugging, and leave an even and opaque layer of color. Restricted to the upper lids, longevity is decent for me, though I've heard from a friend that never stay put for her. This is not Armani or YSL quality (and the waterproof thing is bogus), but if you find a color you truly love it's worth a try. Bottom Line: Not for oily lids or rainy days. 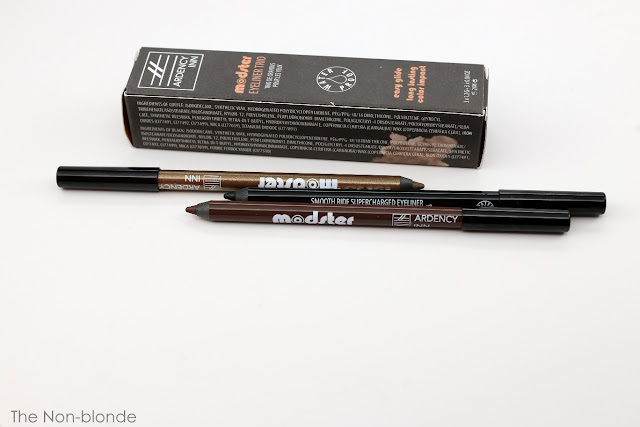 Ardency Inn Modster Eyeliner Trio ($29, made in Italy) is a limited edition, available at Sephora. Thank you for your review of Acqua di Parma's Ambra. I hate perfume, but your review convinced me to try it, and I absolutely love it. I got a sample size from Sephora and now I am hooked.